Paramedic Ride is a not-for-profit organization dedicated to strengthening the Paramedic community. We are raising funds in support of the Canadian Paramedic Memorial Foundation. The foundation is constructing a monument in the Nations' Capital - Ottawa, Ontario, to commemorate those Paramedics who have lost their lives in the line-of-duty. This important monument will be a place where family, friends and colleagues can remember their loved ones and honour the dedication and sacrifice of all Canadian Paramedics who have lost their lives. 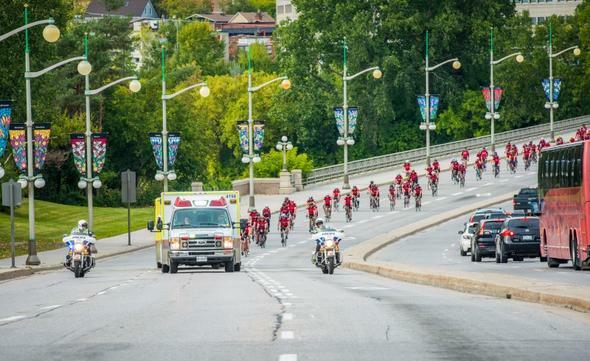 We hope you can join us on one of this years four Paramedic Rides and experience the journey with us. Visit us at Paramedic Ride or the Memorial Foundation to learn more. Thank you so much for your generous support.